In 2009, the state Department of Natural Resources, after a long, worried look at the present dam’s condition, ordered Milwaukee County to either fix it by the end of 2014 or remove the dam. The 2009 order also required the dam gates be left permanently open to alleviate stress on the structure. The DNR order ignited debate over the dam’s future. Environmental groups, including the 650-member Milwaukee Riverkeeper, want the elderly dam removed or, at a minimum, repaired with the addition of provisions for fish passage. Riverbank property owners upstream want the dam repaired or replaced to maintain a substantial impoundment west of the dam. An alternative, removing the dam and installing a four-foot-high rock “ramp” to provide upstream impoundment while looking more like a natural river, has also been kicked around. The final decision is largely in the hands of Milwaukee County, which originally signaled it favors repairing the existing dam. However, in early September of this year, the Milwaukee County parks system took the contrary position of recommending demolition. Regardless of your feelings about the dam, the Depression-era structure has an interesting history. 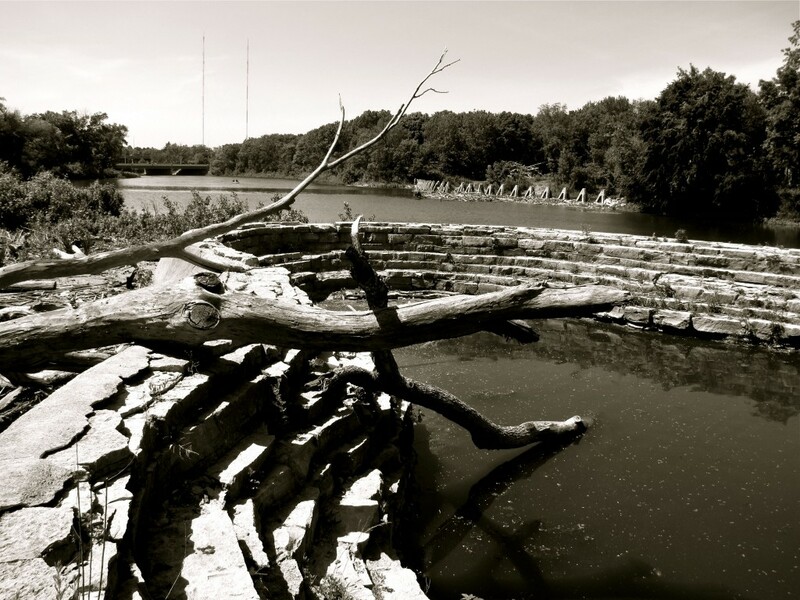 Prior to the dam’s construction, the Milwaukee River cut an S-shaped course through what is now Lincoln Park and an outcropping of limestone created a wide natural pool in the river ideal for boating and swimming. However, the outcropping was also blamed for occasional flooding north of Silver Spring Drive so, in 1933, the rock shelf was removed by blasting and the river straightened. The water level dropped after the removal of the outcropping. 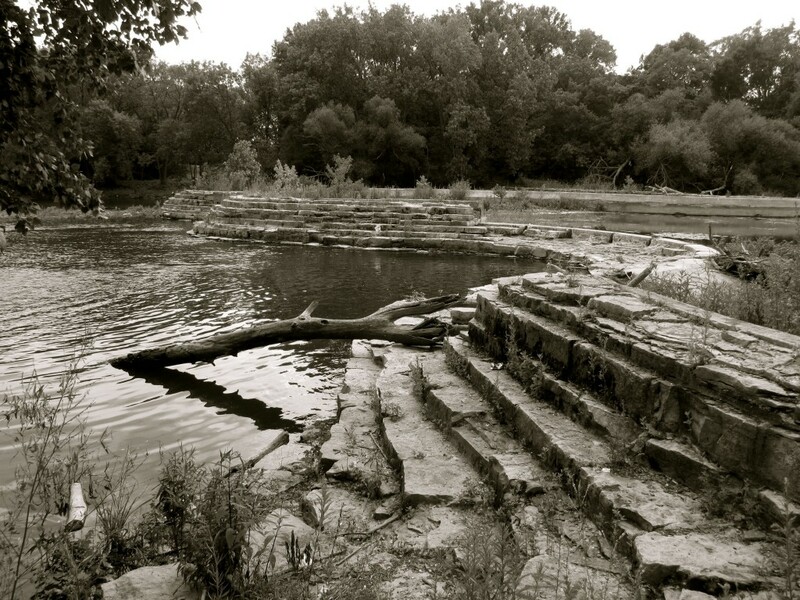 Anxious to preserve the recreational uses of the river, Milwaukee County received a permit from the DNR in 1937 to operate a dam to maintain a fixed impoundment pool. The dam was a federally funded project by the Civil Works Administration and the Civilian Conservation Corps (CCC), which maintained a large worker camp in Estabrook park for several years. The CCC was established in 1933 to provide employment for young men age 17 through 28. The men had to be single, unemployed, and from needy families. The men enrolled for six months at a time and could stay in the program a maximum of 18 months. During their enrollment, the men lived in camps (there were six camps in Milwaukee County), wore government-issued clothing, were given three meals a day, and followed strict disciplinary guidelines. In Estabrook Park, CCC workers removed 100,000 cubic feet of limestone from the riverbed, crushed it, and used some of it to build the dam and the rest of construct roads. For this they were paid $5 per month and an additional $25 was sent to their families. 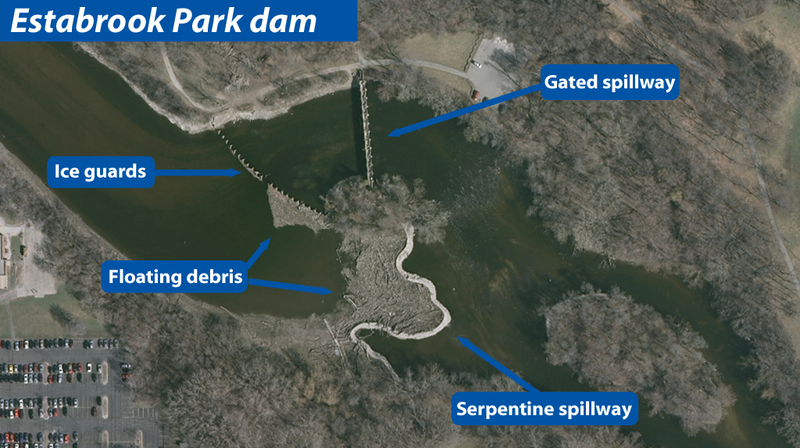 The dam’s major structures are labeled in this photo, including the serpentine spillway designed to resemble a natural rock shelf. The dam accumulates floating debris and periodic clean-outs are expensive and difficult, adding to the dam’s ongoing maintenance costs. The dam, which cost $65,000 to build, has three major components divided by a small island in the middle of the river. North of the island is a spillway with 10 gates, which can be positioned to control water flow. Upstream to the west a row of triangular ice breakers protect the gates from ice floes or tree damage. South of the island, and rarely seen by park visitors, the dam takes the form of a 582-foot-long serpentine wall only a few feet higher than normal water level. 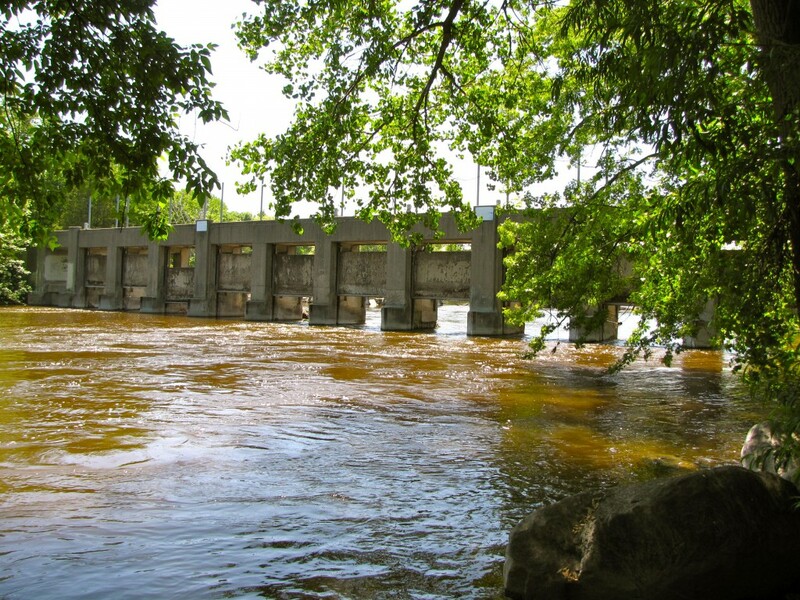 Consequently, the Estabrook dam has a limited ability to control downstream flooding. 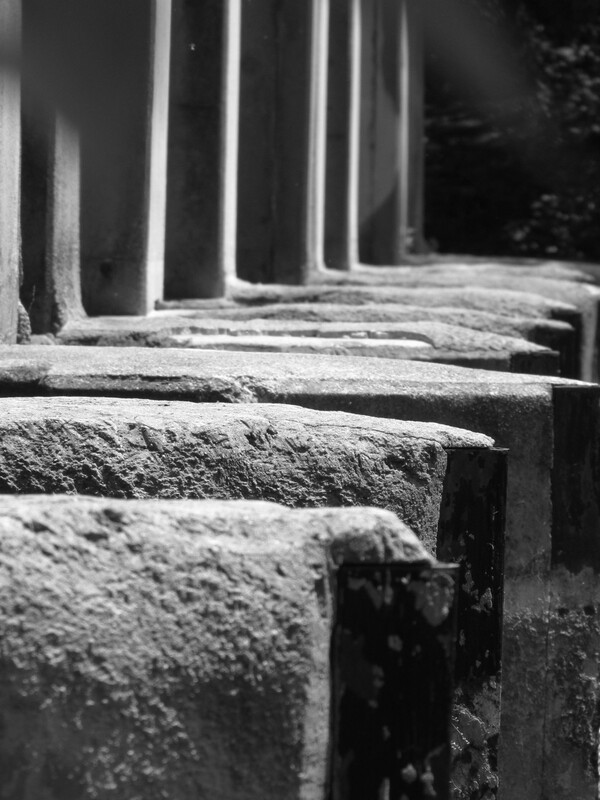 The county was thinking about aesthetics in the 1930s, it faced the serpentine wall with limestone blocks to mimic a natural rock shelf. Until recently, the central island, called Dam Island, was considered federal property under the jurisdiction of the U.S. Bureau of Land Management. A BLM review in late 2014 determined Dam Island is part of Estabrook Park. The dam is now in sad shape. Engineers report significant deterioration, as might be expected from a 77-year-old structure, but say the basic structure is fundamentally sound. In fact the original builders notched the limestone riverbed so that the dam’s base nestles in bedrock like a tooth in its socket. The engineers concluded the dam is potentially repairable and, in 2010, the county voted to do just that. To keep those plans moving forward, the county is now in the process of compiling an environmental assessment. The assessment requires that other alternatives be considered. The parks department favores demolition, saying it is the cheapest of all options. Will the country board also change course? 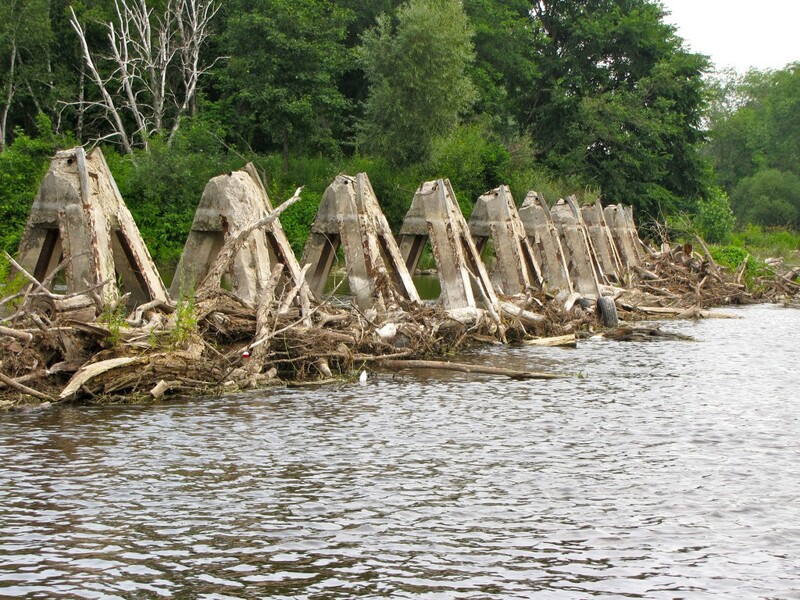 We will find out soon what the future holds for the Estabrook dam. Updated November 2014 to clarify the Federal government’s relinquishing claim to Dam Island. A review of survey maps determined the island is part of Estabrook Park.